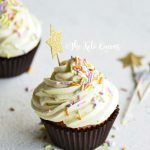 Small Batch Keto Birthday Cake Cupcakes with Fluffy Vanilla Bean White Chocolate Buttercream. For the cupcakes, preheat the oven to 350F; line 2 wells in a cupcake tray with paper liners. Whisk together the almond flour, flaxseed meal, tapioca starch, baking powder, and salt in a medium bowl. Beat together the butter and erythritol in a large bowl, and then beat in the egg, vanilla extract, almond extract, and liquid stevia. Whisk the dry ingredients into the wet all at once. Fold in the sprinkles. Pour the batter into the 2 lined wells, and bake until he cake is puffed and golden brown along the outside, about 20 to 22 minutes. Cool the cupcakes completely before frosting. For the frosting, melt together the cacao butter and butter in a double boiler or in the microwave. Stir in the Swerve Confectioners, vanilla bean paste, almond extract, liquid stevia, and salt. Gradually beat in the cream until it reaches your desired consistency. Briefly chill the frosting in the fridge (about 30 minutes), beat it again, and then frost the cooled cupcakes. The frosting will stiffen if refrigerated, so it’s best to store these in the fridge and let them sit for 15 minutes at room temperature before eating. Sugar alcohol content for the entire recipe is 27g or 6.75g per 1/2 cupcake. Net carbs = 9g total carbs - 6.75g sugar alcohol = 2.25g net carbs per 1/2 cupcake.